and 23 guests online now. Rev. 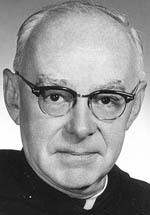 Edmund J. Hayes, O.S.A. entered eternal life June 19, 1968. Edmund Joseph Hayes was born May 12, 1915 in Springfield, Massachusetts, to Denis and Helen (Lyons) Hayes. He was Baptized July 11, 1915 at Our Lady of Hope Catholic Church, Springfield. He received the Sacrament of Confirmation December 16, 1927 at St. Rose Catholic Church, Chelsea, Massachusetts. He received his elementary education at St. Rose School, Chelsea, and his secondary education at Cathedral High School, Boston, Massachusetts. He was received into the Augustinian Novitiate September 10, 1933. He professed simple (temporary) vows in the Order of St. Augustine September 10, 1934 and solemn (permanent) vows September 10, 1938. He earned a B. A. in Philosophy from Villanova College, Villanova, Pennsylvania, in 1938. He then pursued theological studies at Augustinian College, Washington, D. C. He was ordained a Priest June 10, 1941. He did additional studies at Columbia Technical Institute, Arlington, Virginia. In 1942 Father Hayes was assigned to teach at St. Rita High School, Chicago, Illinois. In 1962 he was assigned to Mendel Catholic High School, Chicago. Father Hayes experienced health problems for many years. He died June 19, 1968 of arteriosclerotic heart disease.